Enshrined by the National Aviation Hall of Fame in 1979, he was honored "honored for his outstanding contributions to aviation by his development of practical aerial cameras that that were instrumental in the birth and growth of the aerial mapping and aerial surveying industries; for his development and production of early cabin monoplanes used in aerial mapping, by early airlines and bush pilots; and for his entrepreneurship in forming nu merous business enterprises that produced a wide variety of aeronautical and astronautical related products for private, public and military use." In appreciation of Fairchild's contributions to aerial surveys and Long Island aviation, below is his profile as posted on Butler County Warbirds, Inc. and several of my favorite Long Island Fairchild aerials. Adapted from Butler County Warbirds, Inc. It is an understatement to describe Sherman Fairchild's range of interests as incredibly varied. In addition to photography, aviation and electronics, he was also a successful entrepreneur in photoengraving and sound recording. An inventor who held more than 30 patents, he also was one of the nation's leading industrialists. Yet he never lost his zest for invention or his interest in technology. It was his nature to take a problem and develop a product to solve it. It was this characteristic which led to the start of his first business venture. He had been taking engineering courses at Columbia University when, during World War I, he volunteered his services to the Signal Corps as a civilian expert in photography. It was then that he first encountered an aerial camera and the problem of image distortion in aerial photography. He spent the better part of the next two years devising a solution to the problem. The result was the world's first successful aerial camera shutter. The between-the-lens shutter exposed the film frame all at once as the camera mounted in the airplane moved through the air, thus eliminating the image distortion which had previously prevented accurate aerial mapping. On February 9, 1920, at the age of 24 he founded the Fairchild Aerial Camera Corporation. Fairchild's cameras soon became the world's standard. Since, they have been employed by commercial firms, the military services and government agencies to map all of the United States, South America, millions of square miles of other continents and, via the Apollo 15, 16 and 17 missions, more than 50 per cent of the surface of the moon. In 1925, Fairchild formed the Fairchild Aviation Corporation to manufacture airplanes. He considered the freezing cold, open cockpit biplanes of the time unsatisfactory aerial mapping platforms. Characteristically, he believed there should be a better way. With typical practicality, he produced the FC-1, a high wing, enclosed cabin monoplane. The FC-1 was not only an excellent camera platform, it incorporated such technological innovations as folding wings as well as slots and ailerons used as flaps for greater stability. It has been termed.-d the first airplane with predictable flying characteristics. Among those early Fairchild-built planes which gained fame was "The City of New York," a Model FC-2W which in 1928 circumnavigated the globe in a record-breaking 23 days and 15 hours. Another highly publicized FC-2W was the "Flying Telephone Booth," delivered in 1928 to the Bell Telephone Laboratories. In a little more than two years, it made 1,613 flights carrying practically all of the well-known aviation figures of the day for demonstrations of the new two-way radio that soon made possible regularly scheduled air transportation. Still another was the '--stars and Stripes," the photo reconnaissance plane for Admiral Byrd's 1928-29 Antarctic Expedition, which made the first flight from the Antarctic continent. In 1936, the Fairchild Airplane Corporation was reorganized into two major and distinct corporations. One has become Fairchild Industries, today a diversified aerospace and communications company. It includes in its corporate structure a complex of famous aviation names and companies which have manufactured and delivered nearly 40,000 aircraft of all types to military and civilian users throughout the world The other has become Fairchild Camera and Instrument Corporation. It too is known worldwide and today produces photographic and electro-optical imaging systems, electronic timing and control systems, RF systems including electronic countermeasures and frequency management, electronic data systems and secure communications systems. One of the most interesting aspects of Sherman Fairchild's career of accomplishment is that there was little in his background to account for his fascination with technology. He was born April 7, 1896, in Oneonta, a small upstate New York town. His parents were well-to-do and his father was for 12 years a Republican Congressman as well as a successful manufacturer and one of the founders, first president and chairman of IBM. 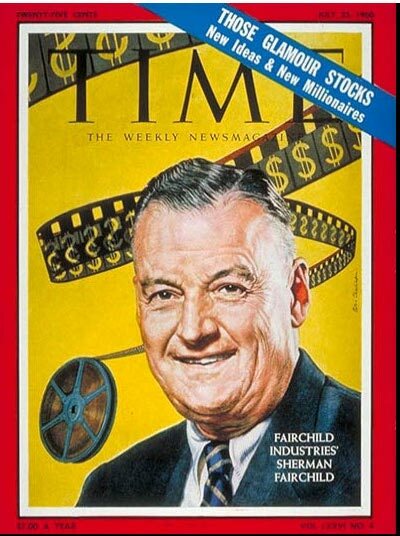 Fairchild became a director of IBM following the death of his father in 1925. There is no doubt that he could have remained comfortably in the IBM structure had he chosen to do so. However, as his entire life demonstrated, he preferred to explore new paths and create new opportunities. In his later years he described himself as one who liked "to try to do things that will make the world a better place." Throughout his life he took an active part in the management of his companies, but management was not a role Fairchild relished. His basic management philosophy was "get the right man and let him run it." He preferred to function somewhere between scientist and executive, acting as a kind of technical interpreter between the product side and accounting-management side of business. Of his approach to solving technical problems, he said, "First, set an objective you are trying to reach. Never mind all the people who say you can't. You have to just go ahead and figure out a way to do it." 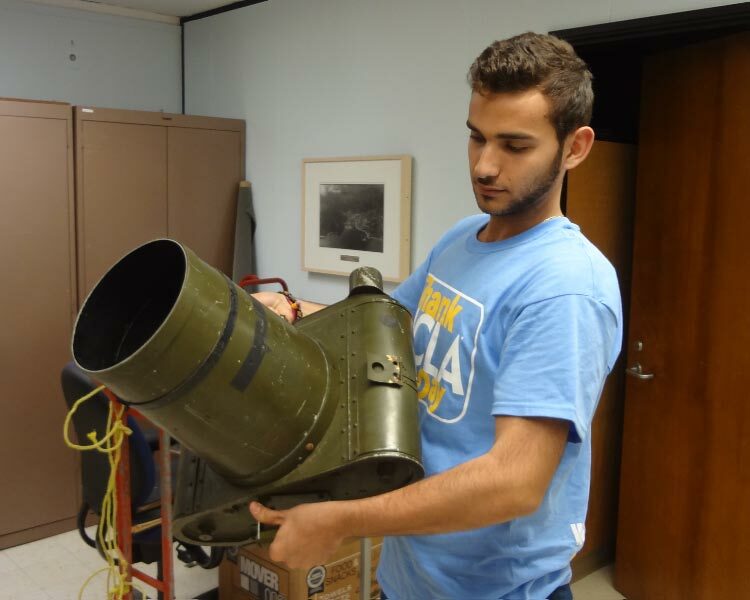 One of the innovative Fairchild cameras used for aerial surveys. 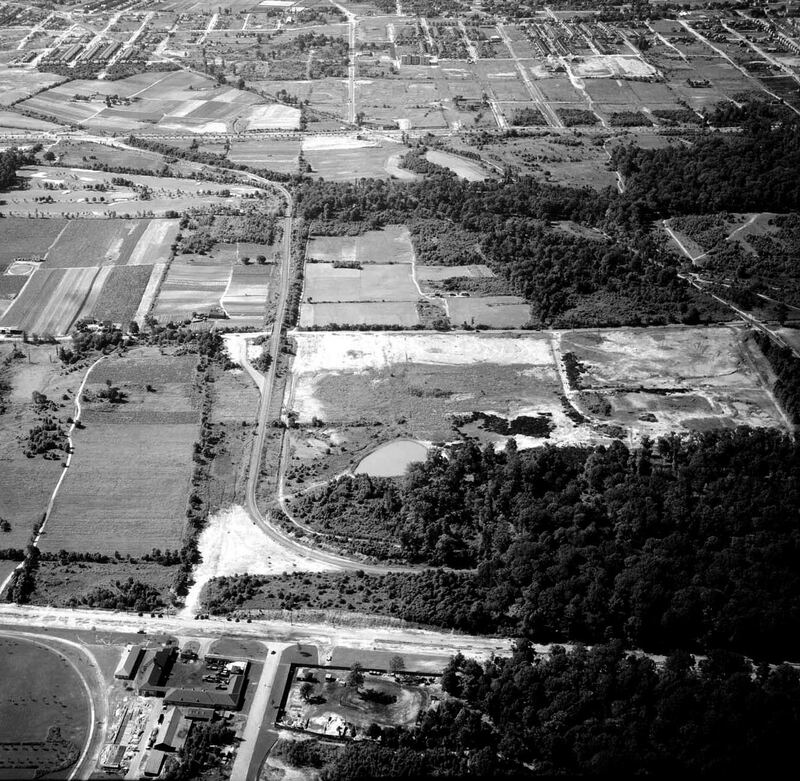 This 1938 aerial shows the western terminus of the Motor Parkway from Horace Harding Boulevard heading south towards Union Turnpike. Note the Francis Lewis Boulevard to the east of the Motor Parkway had not yet been built. 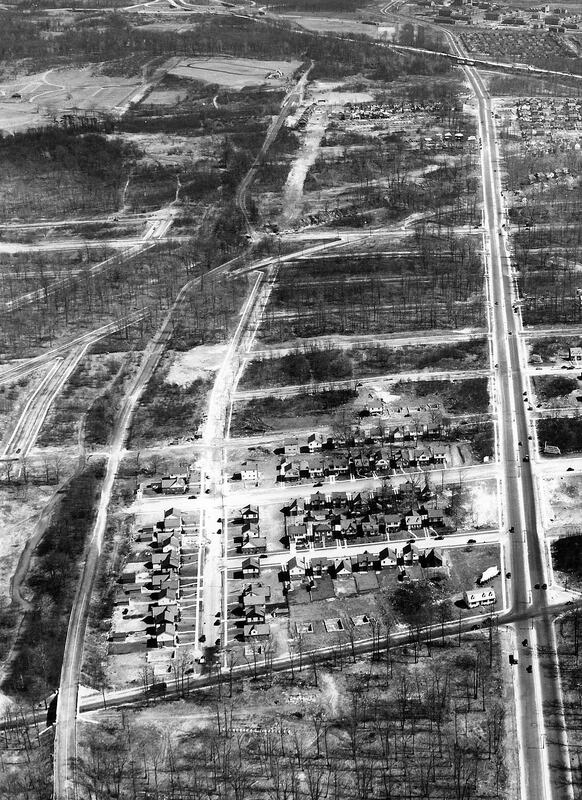 The Motor Parkway (left) in 1941 looking east from Hollis Hills. 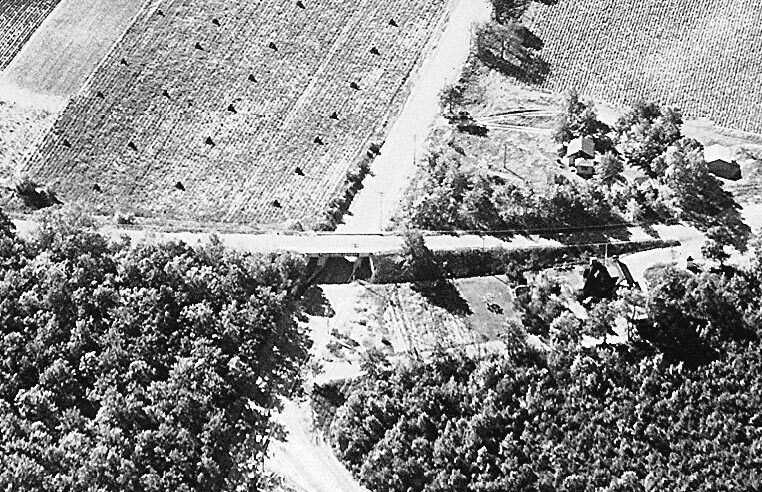 This 1935 aerial shows the Long Island Motor Parkway crossing over Round Swamp Road in Bethpage. A closeup of the aerial reveals the Round Swamp Road Motor Parkway Bridge and the Bethpage Toll Lodge to the right. 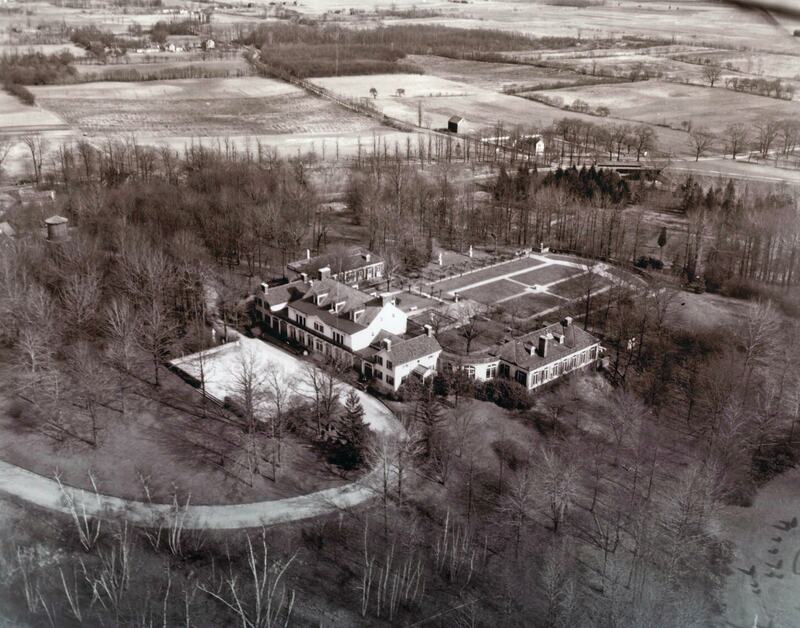 Click on the image and you can see the lodge entrance off Round Swamp Road. 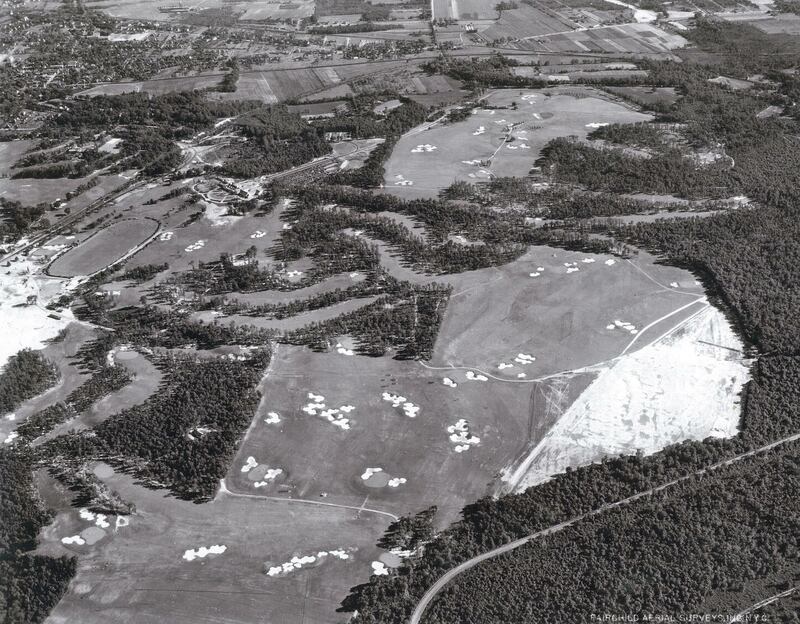 A 1935 aerial of the Bethpage State Park golf courses looking south-west. 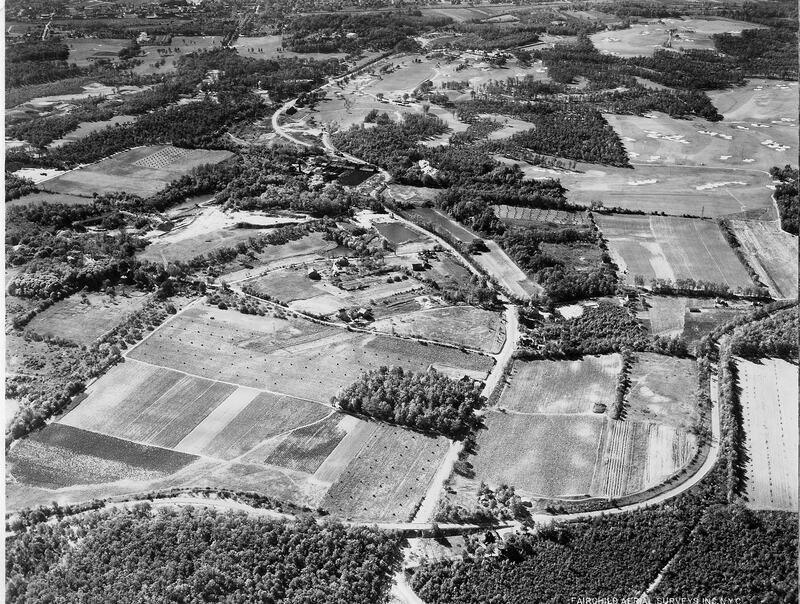 A section of the Motor Parkway can be seen bordering on the golf course on the right corner of the aerial. 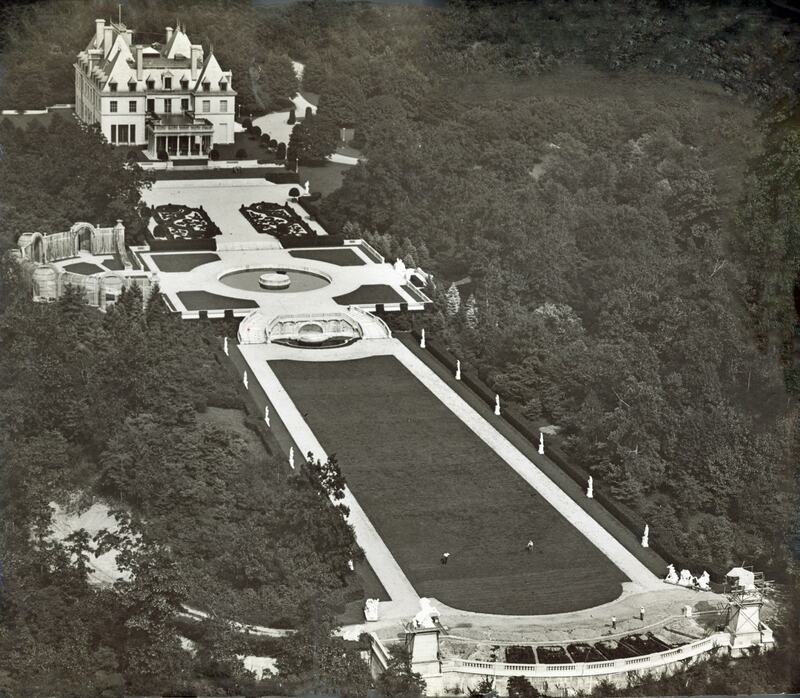 An undated aerial of "Beacon Towers", the Sands Point mansion of Willie K.'s mother, Alva Vanderbilt Belmont. 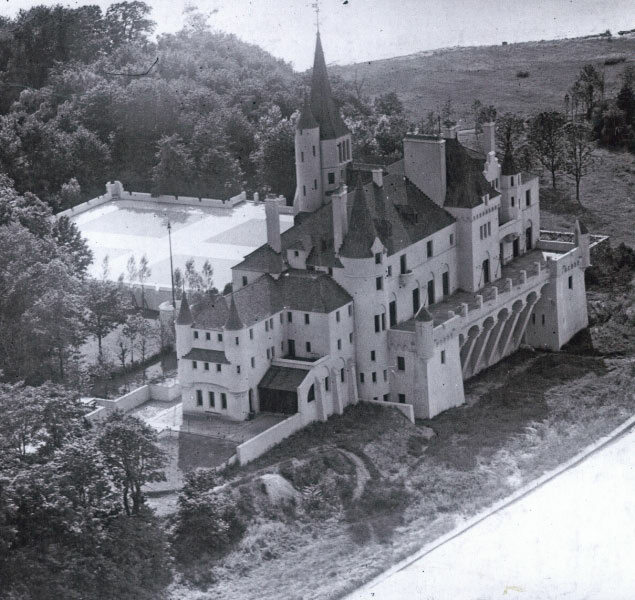 A spectacular 1920 aerial of Clarence Mackay's Harbor Hills estate in Roslyn (now East Hills). Happy Thanksgiving and thanks for posting those wonderful aerials! The LI-Republic Airport Historical Society, located in the Republic Airport Terminal Building, salutes you for this marvelous tribute to Sherman Fairchild and his aerial camera and Farmingdale built FC-2’s. We will tell our members and world-wide Facebook viewers about this wonderful site.